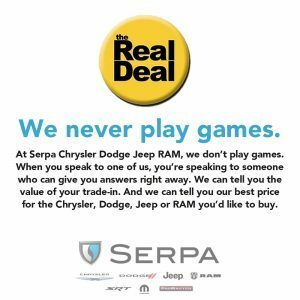 Welcome to Serpa Chrysler Dodge Jeep RAM SRT! With over 2 years under our belt here on Kennedy Road just North of the 401, we have accomplished records sales and service months and have done our best to make an impact in the Toronto market! With four great brands, each meeting every vehicle need, The Serpa team has perfected the art of customer service. Our Motto; Respect. Trust. Enjoy, means that we believe every vehicle purchase experience should be enjoyable, and that afterwards, you would be happy to refer your close family and friends to us so that they too can experience the Serpa way! We respect you, and want to earn your trust, creating an enjoyable experience. We are a fully disclosure dealership, meaning no hidden costs, no secrets, no surprises- and we will share everything with you. A vehicle purchase is something special , from the moment you begin your search to find the perfect vehicle, to the day you first visit our showroom, to the exciting day you take delivery of your beautiful new or pre-owned vehicle. 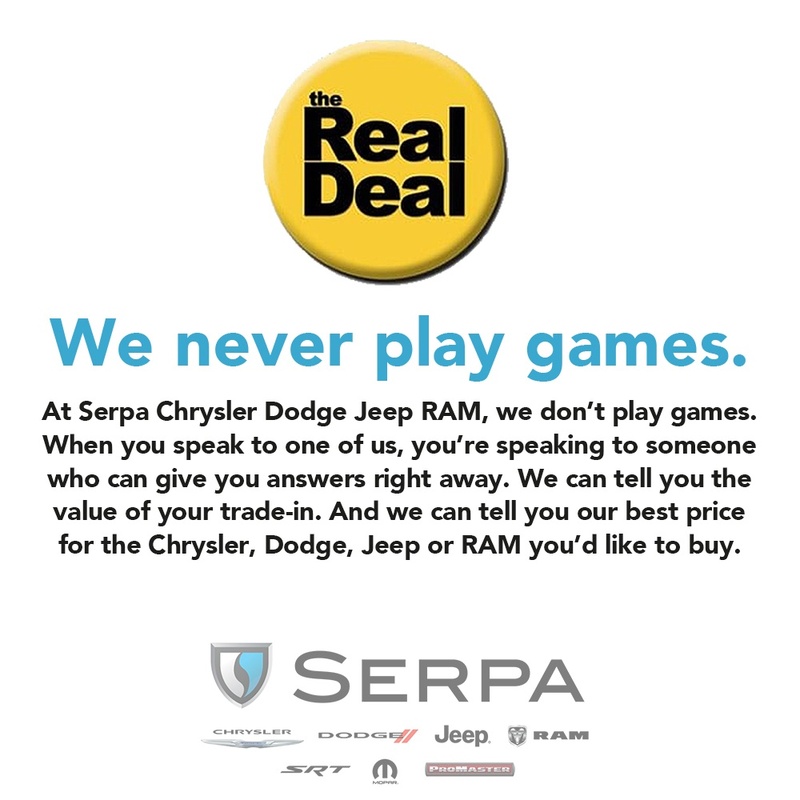 We thank you for your patronage to Serpa Chrysler Dodge Jeep RAM SRT! Don’t live in the Serpa area? That’s okay. We have customers from Whitby, Ajax, Pickering, Courtice, Bowmanville, Port Perry, Clarington, Port Hope, Orono, Newcastle, Uxbridge, Cannington, Minden, Haliburton, Kawartha, Peterborough, Lindsay, Kirkfield, Toronto, Brampton, Oakville, Mississauga, Richmond Hill, Markham, and so on! We sell lots of off make quality used cars! Looking for a Toyota, Honda, Hyundai, Ford, Chevrolet, GMC, KIA, Subaru, VW, Audi, Mazda, Scion, Mercedes, BMW, Nissan, Fiat, Volvo,Cadillac? We can get those for you too.